We arrived Sunday for an extended stay in New Orleans, my husband Willy’s hometown. The first thing we did was take Sweet William and Fergus to their first crawfish boil, hosted by Build Now, the nonprofit organization Willy founded to build new homes for people who lost theirs in Katrina. 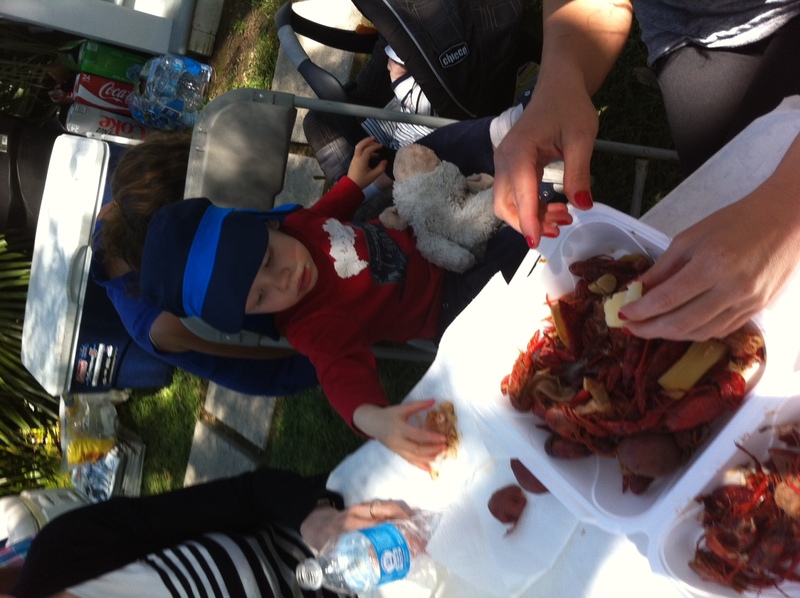 William devoured a pile of crawfish, demonstrating that he really is his father’s son. We spent the last couple of days vacuuming our rental house (using a vacuum with a HEPA filter) and washing the floors, windows, and woodwork with vinegar, soap, and water. It’s an old house, so we’ll vacuum frequently and wash the boys’ hands to prevent them from ingesting lead and other chemicals lurking in the dust. We’ve stocked the cupboards with organic foods and bought a little grill for the backyard, a strategy to help us resist overindulging in New Orleans’ legendary cuisine. Later today we’ll gather our hats, sunblock, picnic blankets, and water bottles in preparation for Jazz Fest, which starts tomorrow. We’ll report back from the Kids’ Tent!